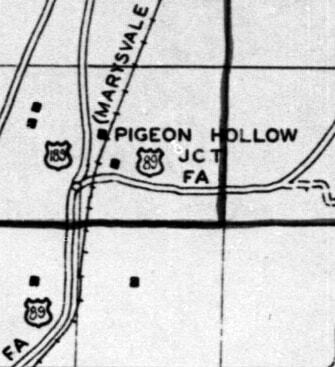 US 189 [i] was an odd little highway that probably should never have been on the US route system. 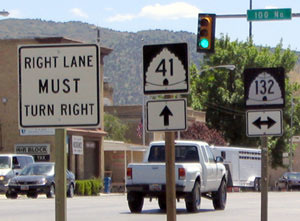 It existed only to connect towns along US 89 in the Sanpete Valley with US 91 at Nephi (US 91 no longer exists in this part of Utah, because I-15 now occupies its historic corridor). South of Provo, US 91 originally ran essentially parallel with US 89, but on the opposite side of the San Pitch, Pavant, and Tushar mountain ranges. There were several roads that crossed these mountains and connected the two corridors, so it seems odd that only one of them was deemed worthy of US route status. 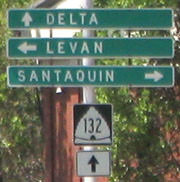 Less than 10 years after it was assigned it was decommissioned; its number was instead used on a more deserving route: that of current US 189. The segment of old US 89 to the north and east from that historic junction has been vacated, so there is not much left to see anymore, but here is an aerial image showing the terminus. last updated May 22, 2016.